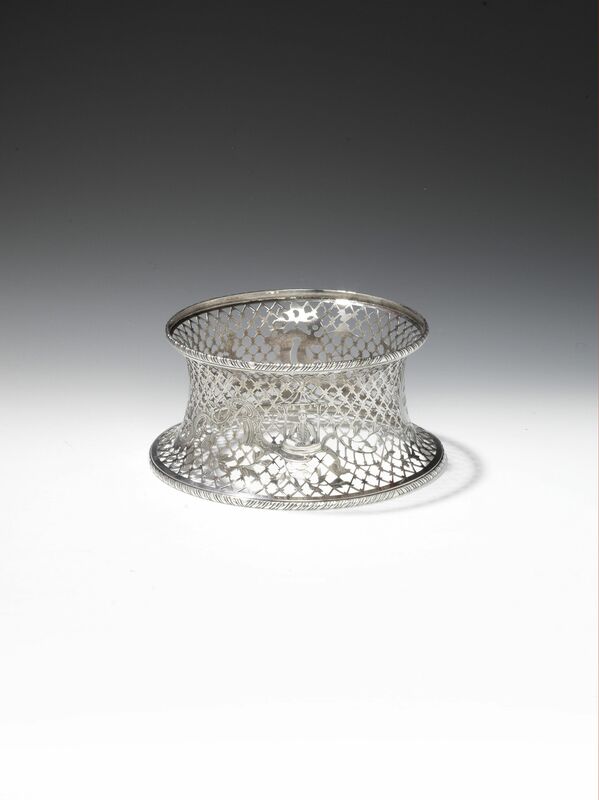 A new world record was set at Bonhams in London when a George III Irish silver dish ring sold for £26,875. The price is inclusive of buyer’s premium. The piece had been estimated at £7,000-9,000. The auction house would say only that it was sold to an overseas buyer. It is the most expensive item of its type ever sold at auction. 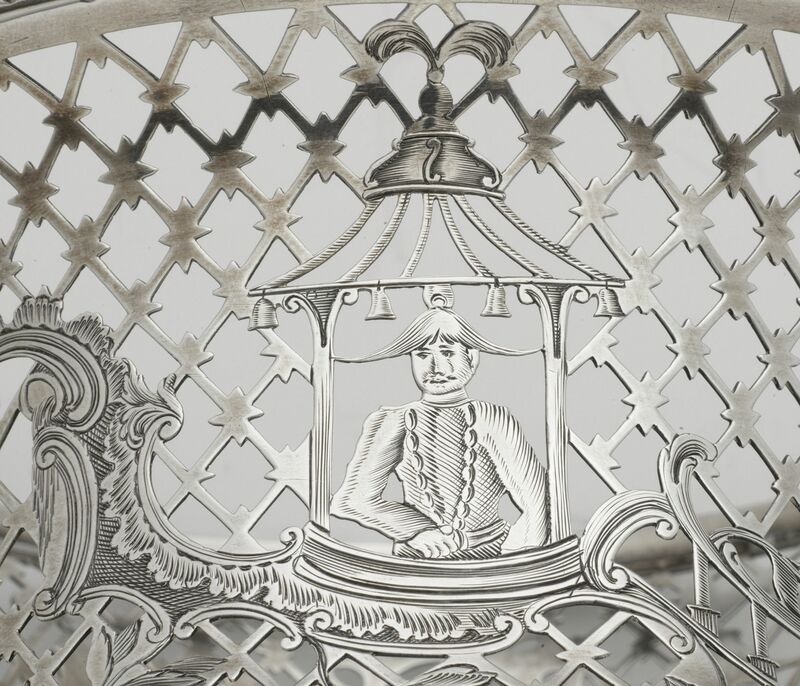 A detail from the record breaking Irish silver dish ring. (Click to enlarge). 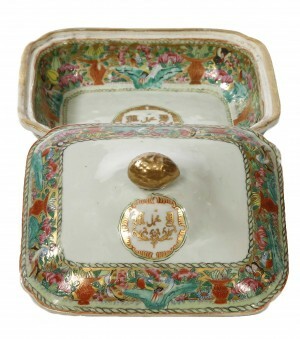 Made by Charles Townsend of Dublin it is decorated in the Chinoisere manner. It bears arms engraved on a lozenge for Lady Elizabeth Cox, daughter of Hugh, 1st Baron Massy of Duntrileague, and widow of the Revd. Sir Michael Cox, 3rd Baronet of Castletown, County Kilkenny who died in 1772. The waisted sides are pierced with fine fretwork. 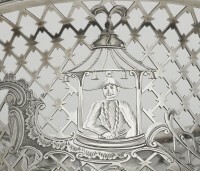 There is a continuous band of pierced and engraved decoration depicting a satyr atop a plinth, a “flaming” scrollwork urn, two gentleman; one wearing Chinese attire peering out of a pagoda window and the other perched on a watery scroll. 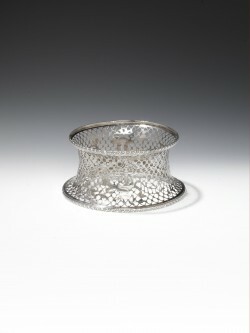 Dish rings are used to prevent hot dishes making contact with the dining table. This one weighs just 11 ozs. 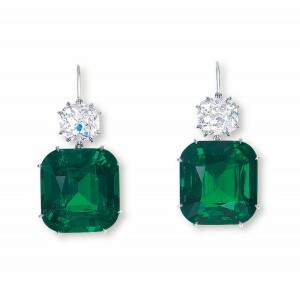 The world record Colombian emerald ear pendants © Christie's Images Limited 2011. (Click on image to enlarge). THERE was a world record for this fabulous pair of Colombian emerald ear pendants at Christie’s in Hong Kong on November 29. They sold for $4,036,318 US, equivalent to $83,000 US per carat. 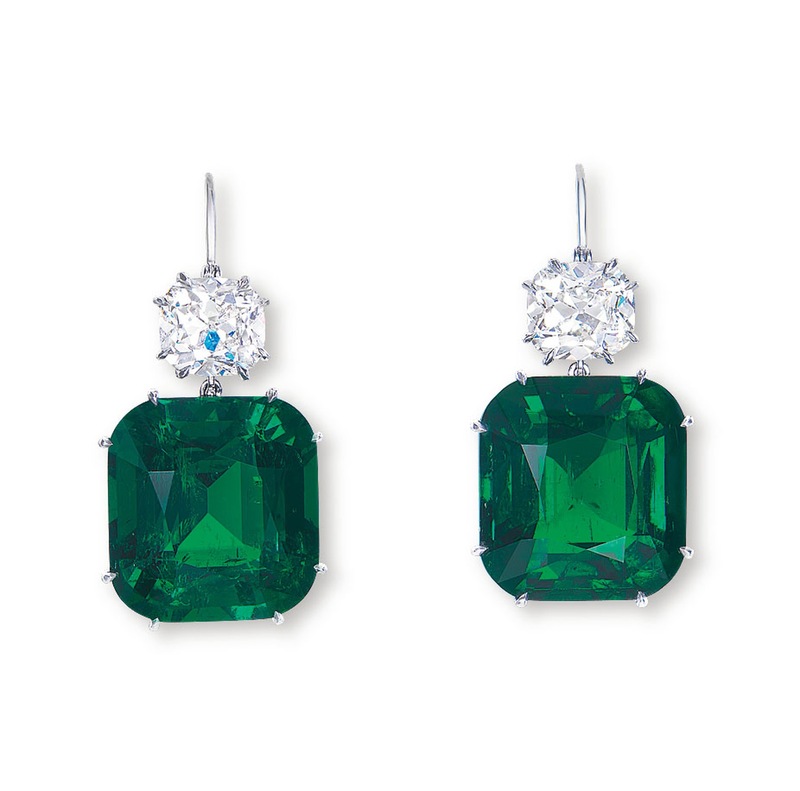 Each pendant is set with a cushion-shaped emerald weighing 25.38 and 23.12 carats, surmounted by a cushion-shaped diamond weighing 3.04 and 3.04 carats, mounted in platinum, 3.6 cm long. Matched pairs of Colombian emeralds of this size and possessing such a high quality with a complete absence of any clarity enhancement are very rare, making the “Estrellas de Colombia” an outstanding pair of Colombian emeralds. At Christie’s sale of magnificent jewels the top lots were two D flawless type IIa brilliant cut diamonds of 35.77 and 35.61 carats. They sold for $8,275,350 and $8,131,654 respectively. 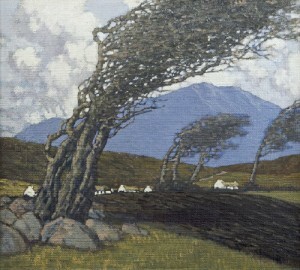 (See post on antiquesandartireland.com for September 25). 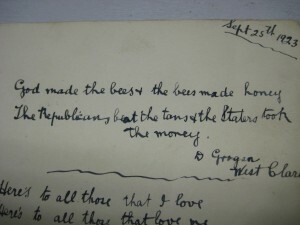 A page from Tom Hales' autograph book. (Click on image to enlarge). UPDATE: THIS SOLD FOR 960 PLUS FEES. 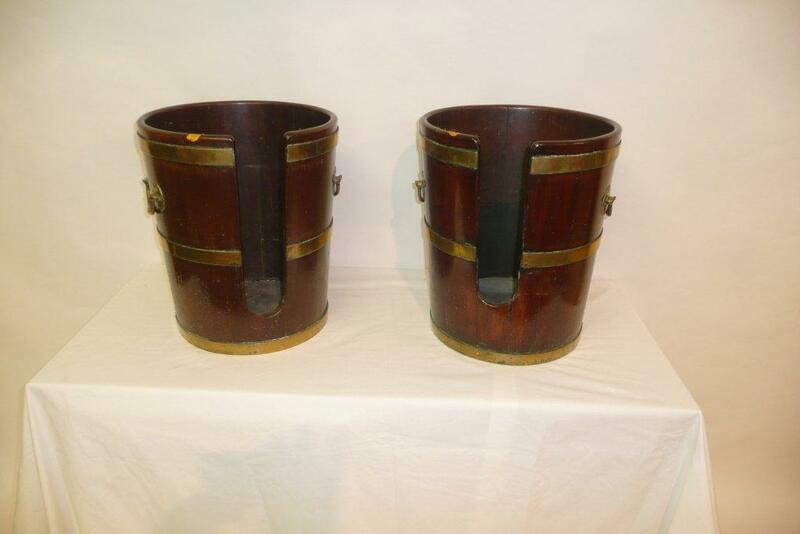 Illustrated here are two examples from one of the more unusual lots at the sale at Limerick Auction Rooms next December 10. 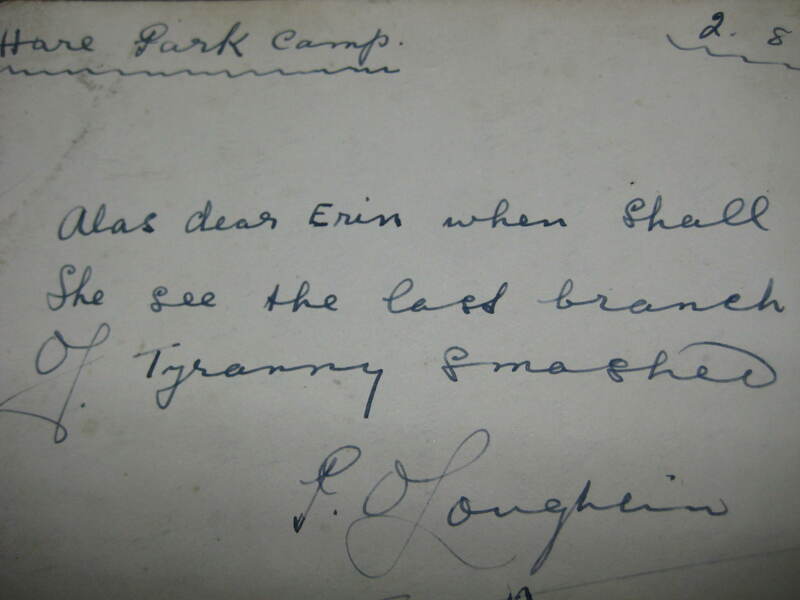 The autograph book belonging to Tom Hales is an unhappy remnant from modern Irish history. The bitter Irish Civil war of 1922-23, accompanied by executions, internments and burnings, was waged by those pro and anti the treaty that established the Irish Free State. It separated nationalists who had earlier been united in their fight for freedom against the British and left Irish society divided. The Fianna Fail and Fine Gael political parties are direct descendants of opposing sides in the war. Tom Hales was a member of the Irregulars, or anti-treaty forces. 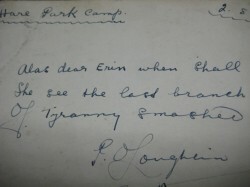 He was interned at Harepark Camp at the Curragh in Co. Kildare. His autograph book, which relates to various dates in 1923, is signed with notes, poems and comments from fellow internees on 57 pages. It is estimated to make between 2,000 and 5,000. The dining table from Dunkathel House made 60,000. The chairs made 9,500. An Irish Georgian three pillar dining table made 60,000 at the Lynes and Lynes auction in Cork on November 26. Auctioneer Denis Lynes had estimated the table, which had an impeccable provenance and came from Dunkathel House at Glanmire near Cork city, at 40,000-60,000. 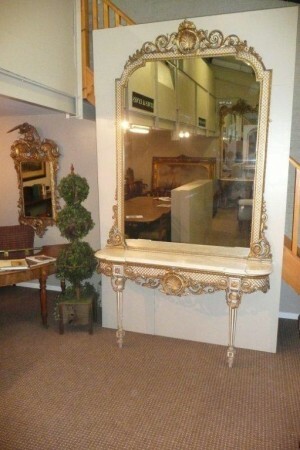 He now thinks it likely that this is the most expensive single piece of furniture ever sold in Cork. 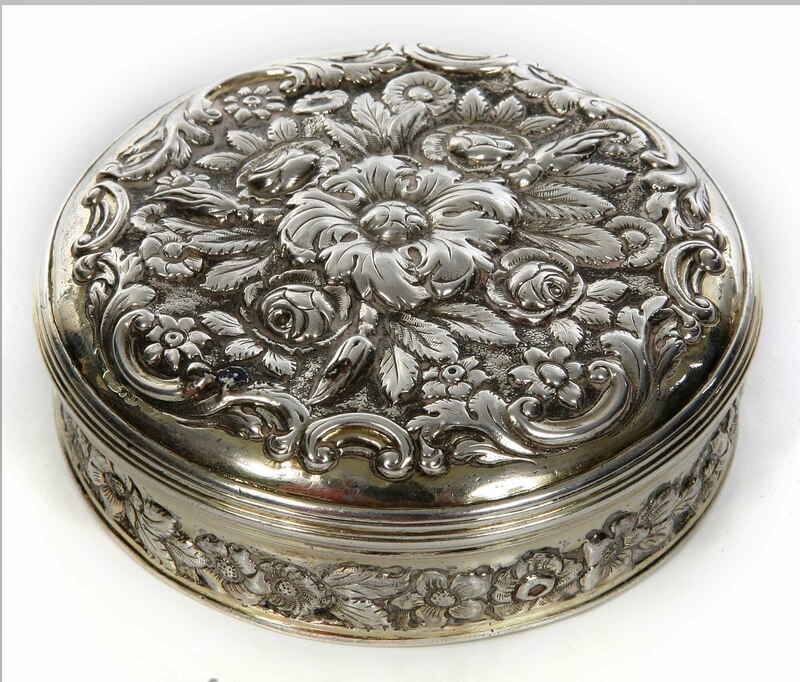 It was bought by the Irish antique trade. 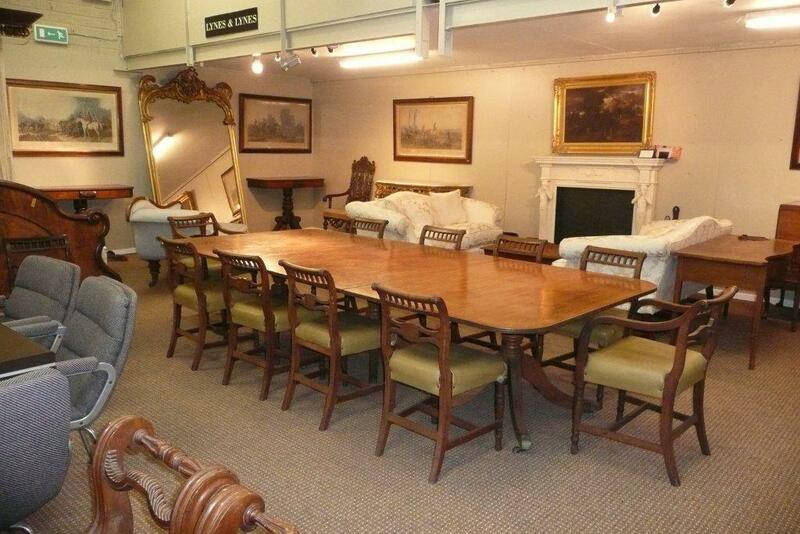 The chairs around the table in this image sold for 9,500. The sale, which featured a number of lots from Dunkathel House and other prime properties, attracted a very large viewing and attendance. Some of the ceilings in Dunkathel House are 15 feet high, and some of the larger furniture pieces did not sell. But a number of the big ticket pieces went under active negotiation after the auction. 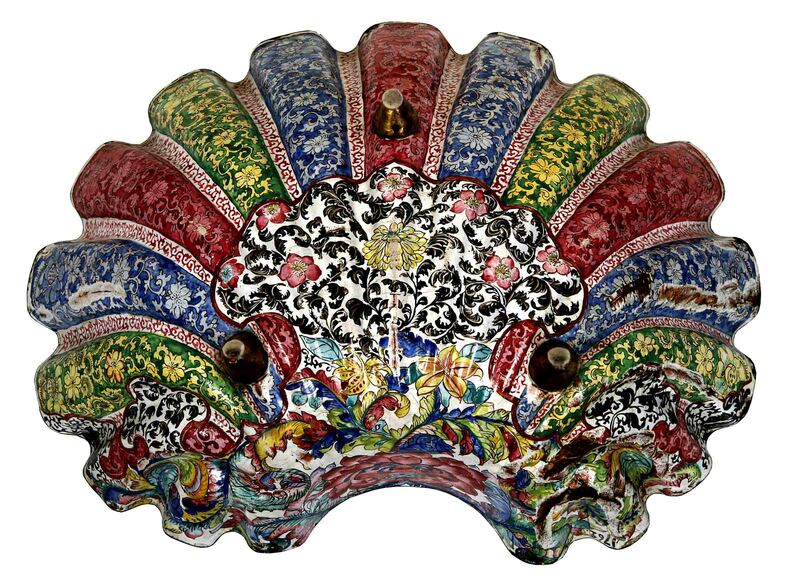 An early 18th century Qing Dynasty enamel or bronze basin (3,000-5,000). UPDATE: THIS WAS UNSOLD. A 19th century famille rose vegetable tureen and cover with monogram and Arabic description. (300-500). UPDATE: THIS MADE 540. 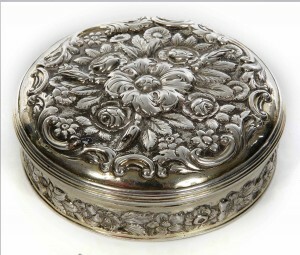 An Irish Provincial silver snuff box by Joseph Johns, Limerick c1730 is estimated at 2,000-3,000. UPDATE: THIS MADE 2,000. This c1800 Irish mould blown decanter is estimated at 200-300. UPDATE: THIS WAS UNSOLD. 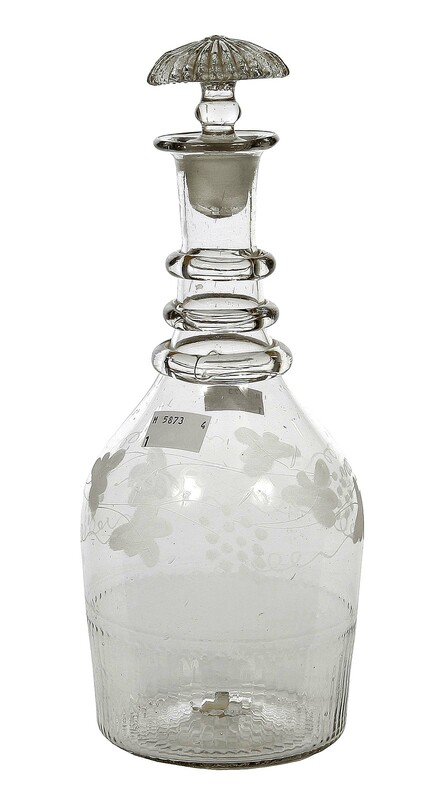 The record breaking Qianlong period snuff bottle. 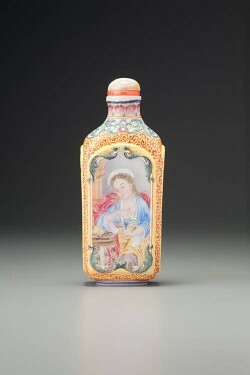 This was the largest snuff bottle of all recorded Imperial Palace enamels on glass. 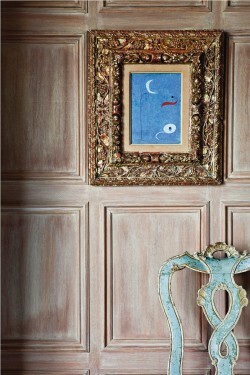 It is set apart by the distinctly European, elaborate trompe l’oeil frames around all four panels. The main panels depict elegant European ladies, while the subsidiary ones are of Chinese landscapes. The influence of missionaries in the court arts of glassmaking and enamelling was significant during the first half of the eighteenth century. At the time this bottle was made European and Chinese court artists worked side by side at the Imperial Palace workshops. 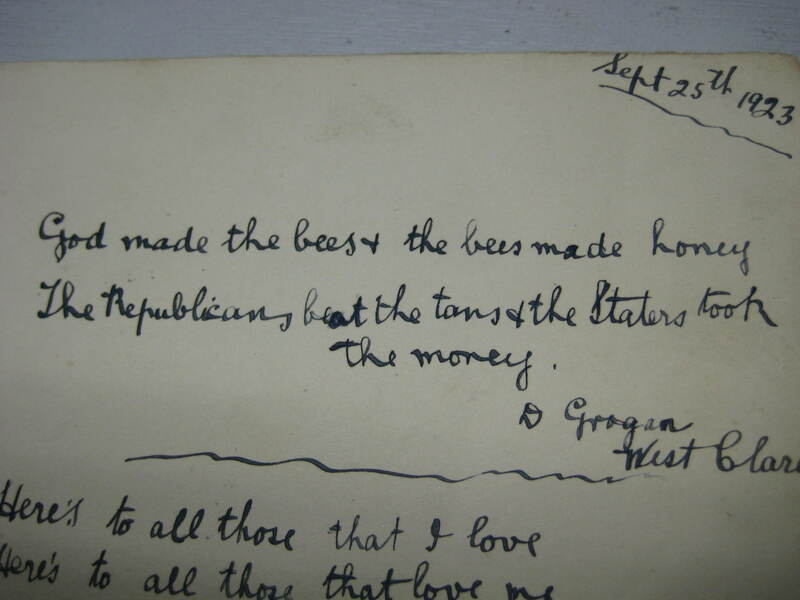 A Yeats once in the possession of George Bernard Shaw is included in the James Adam sale of Important Irish Art in Dublin on December 5. 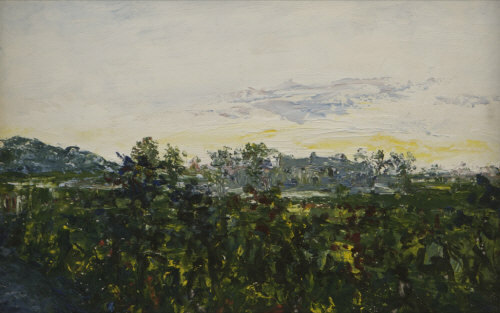 Evening Kildare, which dates from 1936, is one of 14 works that have come from the Beaulieu House collection. They are being sold to finance the continuing upkeep of a property that has been in the same family since the 1660’s. 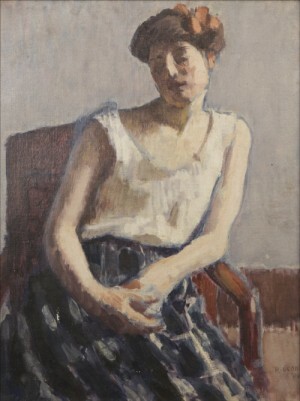 RODERIC O'CONOR (1860-1940) Femme Assise (60,000-80,000) UPDATE: THIS MADE 60,000 AT HAMMER. PAUL HENRY RHA RUA (1876-1958) Wind Blown Trees (80,000-120,000) UPDATE: THIS MADE 97,000. 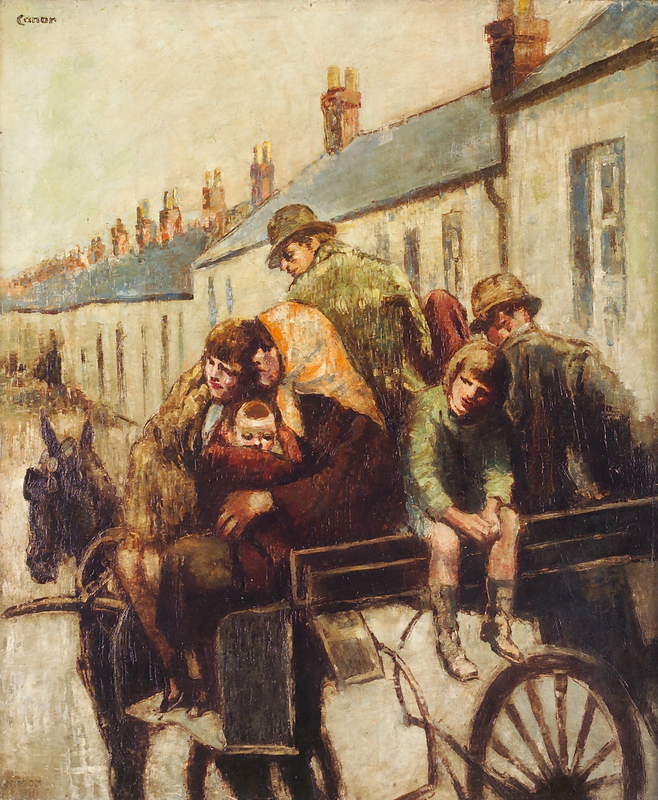 WILLIAM CONOR RUA RHA (1884-1968) The Jaunting Car (No. 1) (35,000-55,000) UPDATE: THIS MADE 70,000. JACK BUTLER YEATS RHA (1871-1957) Evening, Kildare (1936) (30,00050,000) UPDATE: THIS MADE A HAMMER PRICE OF 36,000. A Picasso in the apartment. (Click to enlarge). Living with Art, an extraordinary private collection of 200 masterpieces from antiquity to contemporary art will be offered by Christie’s in London next February. Collected with a focus on aesthetic quality it includes paintings, sculpture, furniture and works of art. It will be offered on February 9 and 10, the same week as the annual spring auctions of impressionist and modern art. 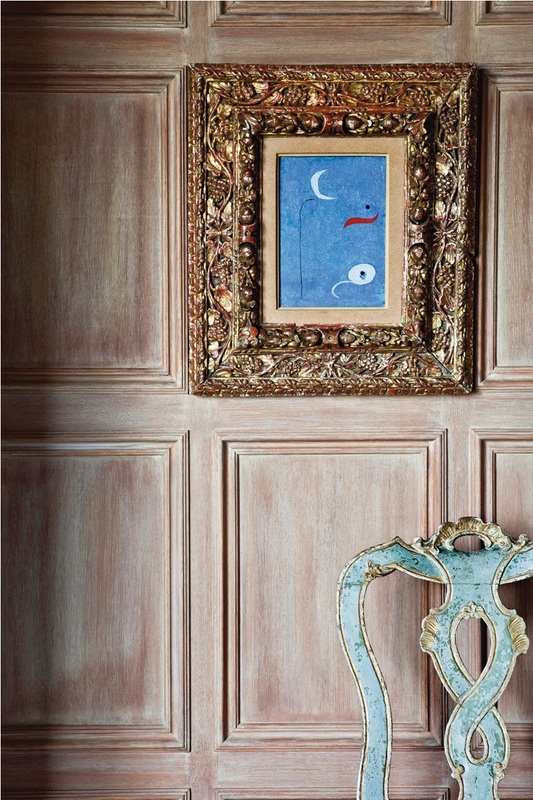 The collection, which includes works by Picasso, Miró, Meléndez, Brueghel, Guston and Chillida, together with Gothic and Renaissance works of art and European furniture, is expected to realize from £25-£35 million. A work by Miro. (Click to enlarge). The deputy chairman of Christie’s Europe, Orlando Rock, said: “This fascinating private collection is a celebration of a couple’s deeply sophisticated connoisseurship, embracing contrasting cultures and millennia. 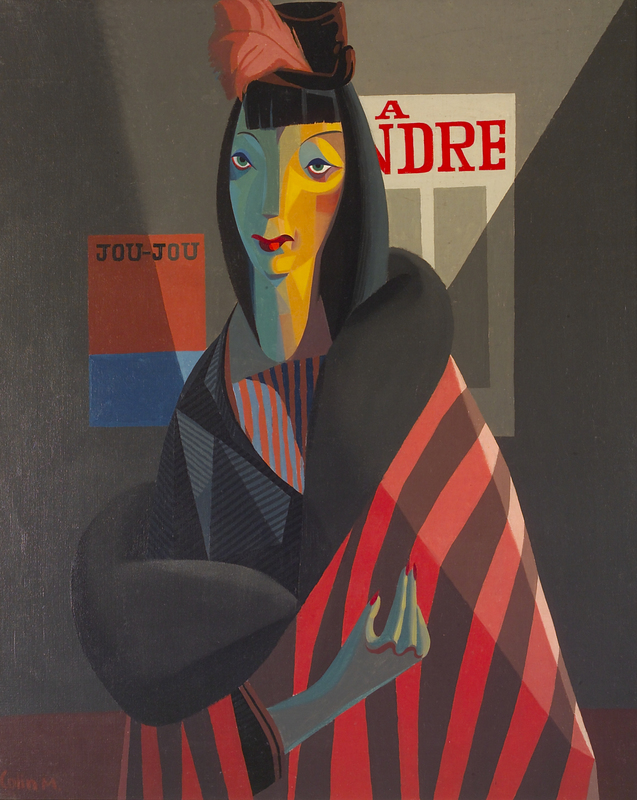 Confident and brave, the couple was not afraid to juxtapose works of art from all periods as long as the key criteria of quality, condition and aesthetic value were met. 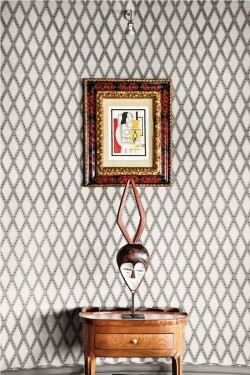 As the interior photographs of their apartment show each and every work was carefully placed to ensure a provocative conversation between different periods of time – Baroque picture frames with modern works on paper, antiquity side by side with contemporary, forms and colour picked out between Leger, tribal heads and specially woven wall coverings”. UPDATE: The evening part of the sale on February 9, 2012 realised £30,060,200. The top lot was Personnages et oiseau devant le soleil, 1946 by Joan Miro. It made £5,081,250 and there was a world record price of £3.5 million for a still life by Louis Melendez. Interest is mounting in the Lynes and Lynes auction at Carrigtwohill, Co. Cork on Saturday November 26. 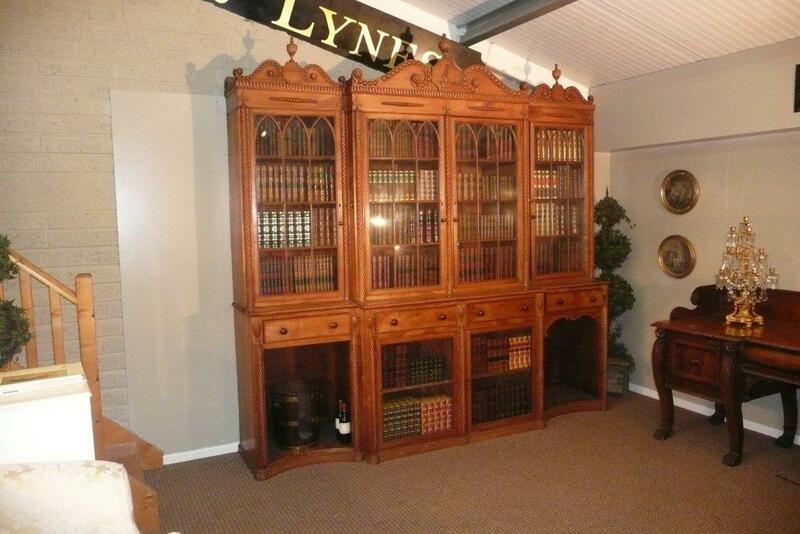 It features some fine antique Irish furniture with impeccable provenance. Among the houses the furniture is from are Dunkathel House in Cork and Castle Freke in west Cork. The catalogue is now on-line. There is a small selection here and there are further posts about the sale on antiquesandartireland.comon November 12 and November 2. 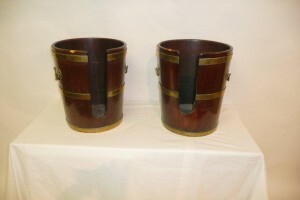 A pair of Irish Georgian mahogany and brass banded plate buckets with carrying handles. (4,000-6,000). UPDATE: IT MADE 3,800. An early Cork 19th century antique bookcase (40,000-60,000). UPDATE: THIS WAS UNSOLD AND IS UNDER NEGOTIATION. 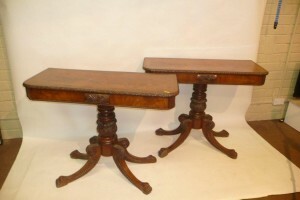 A pair of early 19th century (Cork) mahogany side tables, (30,000-50,000). UPDATE: UNSOLD BUT UNDER NEGOTIATION. 19th century gilt wood console table and matching mirror with shell decoration. (15,000-20,000). UPDATE: THIS WAS UNSOLD. 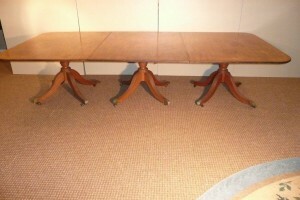 An 18th century Irish Georgian mahogany dining table raised on triple pod supports with reeded splay feet and brass toe castors. (40,000-60,000). UPDATE: THIS MADE 60,000. The Goya portrait at Christies. UPDATE: THIS WAS UNSOLD. A Goya portrait leads Christie’s Old Master and British paintings sale on December 6. 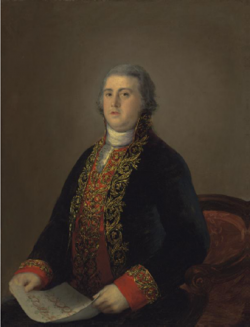 The portrait of Juan López de Robredo by Francisco José de Goya y Lucientes (1746-1828) is estimated at £4-£6 million. There are 36 paintings in the sale spanning 500 years of European art history. There is strong portraiture and a number of Dutch pictures in an auction expected to realize between £18-£26 million. 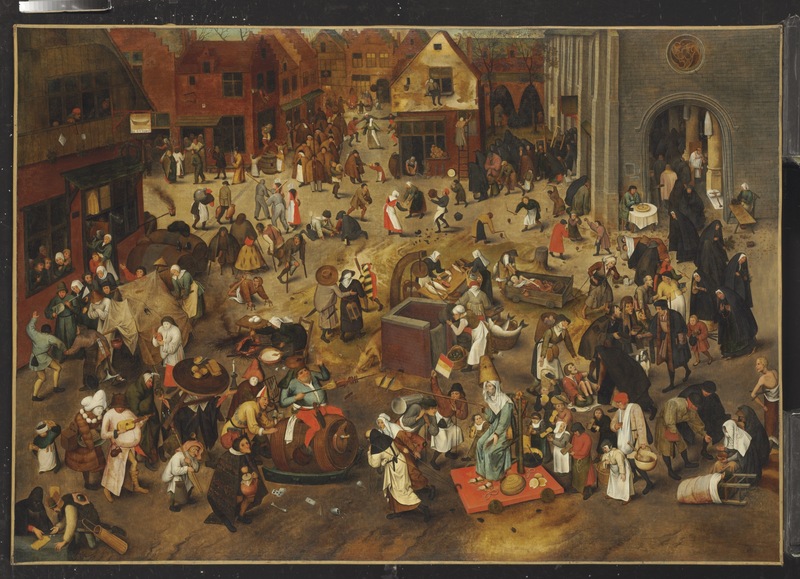 The Battle between Carnival and Lent by Brueghel at Christie's. (Click on image to enlarge). UPDATE: THIS MADE £6,873,250, A WORLD RECORD FOR THE ARTIST AT AUCTION. Other highlights include The Battle between Carnival and Lent by Pieter Brueghel II (1564/5-1637/8) (£3.5-£4.5 million); a full length Portrait of Philip Stanhope, 5th Earl of Chesterfield (1755-1815), by Thomas Gainsborough (1727-1788) (£2.5-£3.5 million); Dutch men-o’-war and other shipping in a calm by Willem van de Velde II (1633-1707) (£1.5-£2.5 million); An old woman spinning in an interior by Nicolaes Maes (1632-1693), 1658 (£1-£1.5 million) and An old man at a casement, 1646, by Govaert Flinck (1615-1660) (£700,000-£1,000,000). UPDATE: THE sale realised £24,132,100, selling 72 per cent by lot and 79 per cent by value. 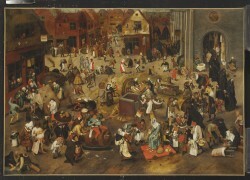 The Brueghel illustrated on the right was the top lot. Record prices at auction were established for Willem van de Velde II, Govaert Flinck, Andrea Soldi and Francesco Zaganelli da Cotignola in a sale where 73 per cent of lots on offer realised a price in excess of the pre-sale estimate.